Fyrflyz is a neat new toy for you to create your very own LED light show. FyrFlyz takes yoyo and diabolo ball to a whole new level of LED fun. Anyone can make awesome LED light shows in a snap! These are so neat and fun to play with; it’s a simple concept that will keep kids of all ages busy for a while! 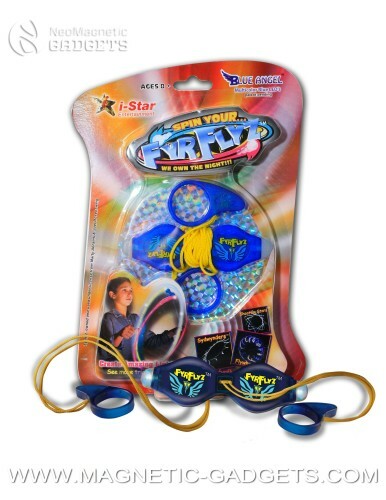 Each FyrFlyz toy is a precision balanced instrument designed to spin on its axis. Simply by swinging the connected two strings and applying tension or allowing slack, you create a continuous movement (figure eights, rings, etc.). The fun begins when the lights go out and the FyrFlyz multi-color LED lights turn the movement into an amazing LED light show that kids can play by themselves or show their friends. We have the FyrFlyz available in three exciting colors: Cyclone (Green and White), Blue Angel (Multi color and Blue) and NytFyr (Red and White). All FyrFlyz have batteries included. Both fun and simple to use, it can be carried anywhere all you need is a little bit of skills with a dose of creativity.